The Oriental Bay Owl is a relatively small unusual looking owl with short rounded wings. 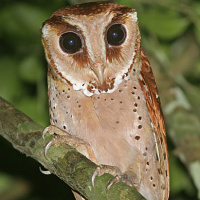 It is also known as the Asian Bay Owl. Typical call - Pasoh, Malaysia. © Dave Farrow. Description: The facial disc is elongated and coloured whitish-vinaceous, with a broad vertical chestnut-brown zone through each eye. The feathers of the rim are tipped blackish and chestnut-brown. The forehead is V-shaped and pale brownish-grey, with the upper part of the 'V' reaching the crown, giving the frontal shield a triangular aspect. Eyes are dark brown or brownish-black, and relatively large. The eyelids are whitish. The bill is creamy-yellow or pinkish-horn. The crown and nape are chestnut, speckled with black and buff shaft-spots. The mantle and back, to the uppertail-coverts, is a paler chestnut, spotted with black and buff shaft-streaks, with the feather bases being bright buff, and each mantle feather having 2-3 black spots on the shaft. The tail is chestnut with a few narrow dark bars. The outer two primary wing feathers (10th & 9th) have white on the outer webs, and are banded with black or chestnut edges. The 8th & 7th primaries also have white on the outer webs near the tips. The throat is creamy-vinaceous. Underparts are vivid pale yellowish-brown, speckled with blackish-brown and buff. Tarsi are feathered to the toe joint with pinkish-vinaceous feathers that become paler near the toe joint. Toes are yellowish-brown or pinkish-buff, with the claws being paler. Size: Length 22.5-29cm. Wing length 172-237mm. Tail length 168-239mm. Weight 255-308g. Females are slightly larger than males. 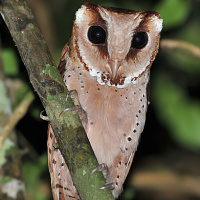 Habits: The Oriental Bay Owl is a nocturnal bird, roosting during the day in holes and hollows in tree trunks, or perched on a branch sheltered by palm leaves or beneath a thick horizontal bend of rattan, usually no more than about 2 metres above the forest floor. This owl is not alert when roosting and is easily approached. Voice: A typical song is a series of 4-7 or more loud, melancholic fluted whistles, given at about 2 notes per second. The call can last 2-8 seconds, and starts loud, with the later notes rising slightly in pitch. These phrases are often repeated many times, sometimes in a descending sequence. These whistles sometimes alternate with a series of different and shorter whistles, kleet-kleet-kleet or kleek-kleek-kleek as the bird moves from place to place. Tends to start calling in the early evening. These owls can be very vocal during the breeding season, particularly after midnight. Hunting & Food: The Oriental Bay Owl feeds on small rodents (such as rats and mice), bats, birds, lizards, frogs, and large insects such as beetles and grasshoppers. They hunt from a perch, flying through dense stands of young trees beneath the forest canopy to make a kill. This is made possible by their relatively short and rounded wings. They also tend to hunt near water. Breeding: Breeding season is March to May around Nepal and Sikkim. In Java, eggs have been recorded from March to July. Nests are in tree holes, rotten tree trunks or stumps, or cavities. Has been recorded nesting in leaf layers of palms in Java. Has also been reported using nest boxes. 3-5 white eggs are laid, measuring 38.0-40.6 x 30.2-31.1mm, at about 2 day intervals. Incubation starts with the first egg, and is done by the female alone while the male brings in food. Incubation and fledging periods are unknown. Habitat: Dense evergreen primary and secondary forest, particularly foothills, sub-montane forest and montane forest up to 1800m in continental southeast Asia. 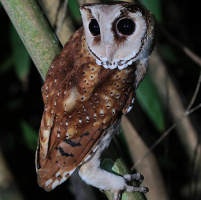 In Java, the preferred habitat is foothills from 200-1000m elevation and sub-montane forest from 1000-1500m, but forest destruction has forced this owl to move from hill and middle zones to montane forest. Highest elevation recorded is 2300m. Also occurs in densely foliaged groves between farmland and rice fields in cultivated areas or in fruit-tree plantations near forest edge. 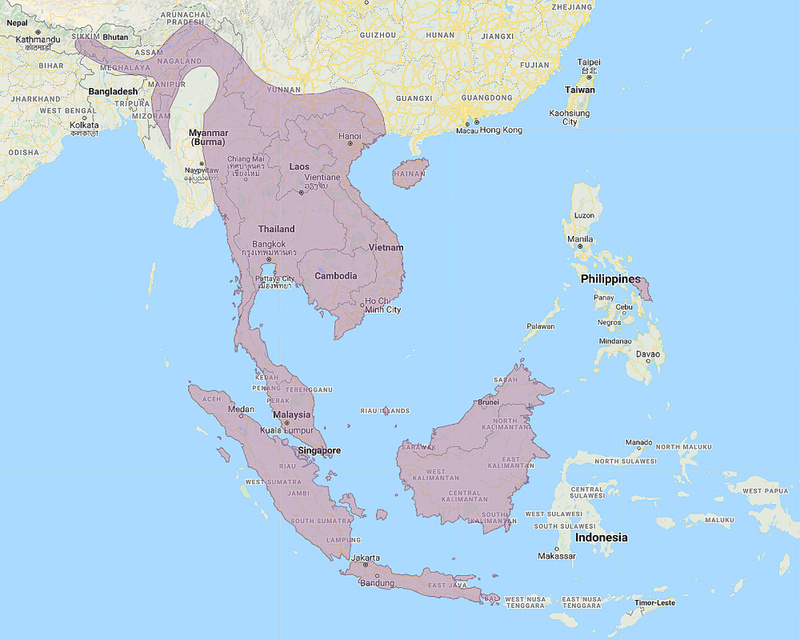 Distribution: Nepal, Sikkim, Assam, Nagaland, Manipur, Burma and Thailand, east to south China, south through the Malay Peninsula to the Greater Sundas. Also recorded on Samar Island in the Philippines. Original Description: Horsfield, Thomas. 1821. Transactions of the Linnean Society of London, 13, pt. 1, Spec. 2, p. 139. 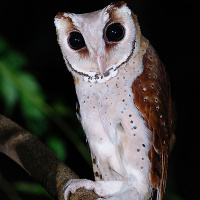 See also: Other owls from Asia, Genus: Phodilus. Page by Deane Lewis. Last updated 2015-09-18.